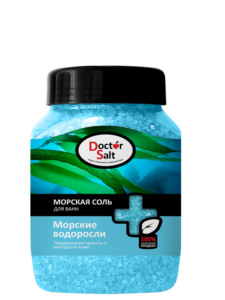 Sea flavored salt for bath “Algae” TM DoctorSalt. The recipe for well-being! – Maintain the beauty and youthful skin. Seaweed extract – the elixir of youth, beauty and health. A beneficial effect on the whole body, enriching the skin with essential minerals and trace elements. Bath with seaweed extract moisturizes, regenerates and delays the skin aging process. It supports collagen production. Mode of application: Dissolve 100-150 g (4-5 tablespoons) of the salt in a warm bath (35 ° C + + 39 ° C). The duration of the water treatments 15-20 minutes. After the bath, it is recommended to take a shower without soap and relax for 30 minutes.